I would like to maintain these settings in an unitary way, preferrably under source control. How can I do that? I know about 'copy settings' when creating a new workspace, but it does not keep updated copies. You could of course export/import those settings. The other approach is to enable project specific settings for some settings. The common settings are just copied/merged in each projects .settings directory, ensuring common rules amongst all projects, whatever the workspace. 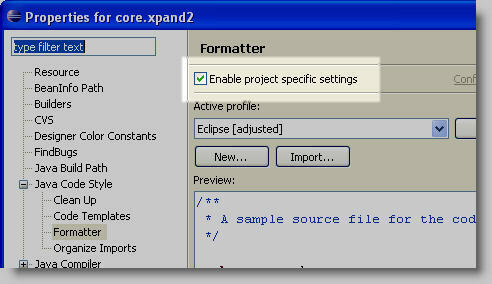 You now have a good example of a separate project maintaining Eclipse preferences, as plugin. See the saneclipse project from Lars Vogel. Eclipse now ships with a tool called Oomph Setup. This tool can be used to record the preference changes that happen in your workspace, synchronize those preferences across multiple machines using an online service, and apply the preferences to both new and existing workspaces. Check out Pulse Freelance Edition. It has the ability to sync workspaces (commercial). Not the answer you're looking for? Browse other questions tagged eclipse settings preferences or ask your own question. How do I save Eclipse launch profiles across workspaces? 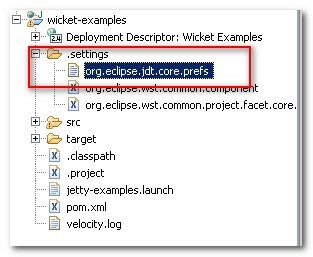 How to set the default workspace settings of eclipse? Eclipse: Can you format code on save? How to turn off the Eclipse code formatter for certain sections of Java code? How to create a project from existing source in Eclipse and then find it? How to automatically import eclipse editor preferences that were previously exported? Eclipse - Universal Preferences Across All Workspaces?